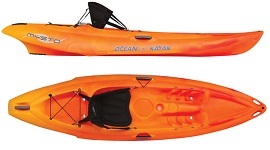 If you are looking for a sit on top kayak either one or two-man, then Ocean Kayak have the kayaks for you. Length 13' 4" / 4.1m. Weight 56 lbs / 25.4kg. Max Capicity 400-450lbs / 181.4-204.1kg. Length 13' 4" / 4.1 m.
Width 34" / 86.4 cm. Weight 61 lbs / 27.7 kg. Capacity 450-500 lbs / 204.1 - 226.8 kg. Max capacity: 550-600 lbs | 249.5-272.2 kg. Length 9' 0" / 2.7 m.
Width 31" / 78.7 cm. Seat Width18" / 45.7 cm. Weight43 lbs / 19.5 kg. Max Capacity 275-325 lbs / 124.7 - 147.7 kg. Length 12' 0" / 3.7 m.
Weight 58 lbs / 26.3 kg. Capacity 375-425 lbs / 170.1 - 192.8 kg. Length 11' 6.5" / 3.6 m.
Width 29.5" / 74.9 cm. Weight 49 lbs / 22.2 kg. Capacity 300-350 lbs / 136.1-158.8 kg.